Pumpkin Bread Pudding with Pecan Bourbon Sauce ~ Learn, Live, and Explore! 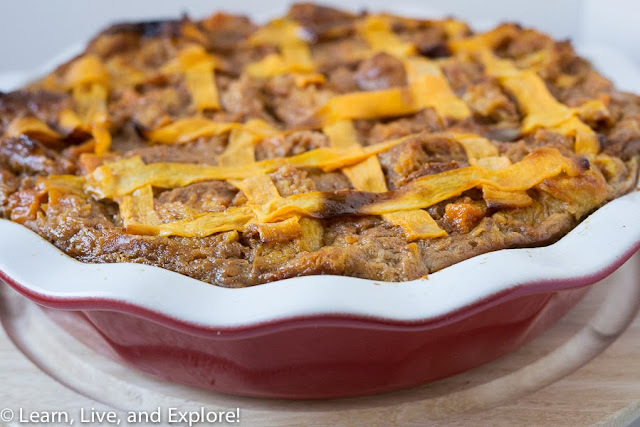 This Thanksgiving, I was searching for a recipe that embodied the flavors of the holiday but wasn't a traditional pie. 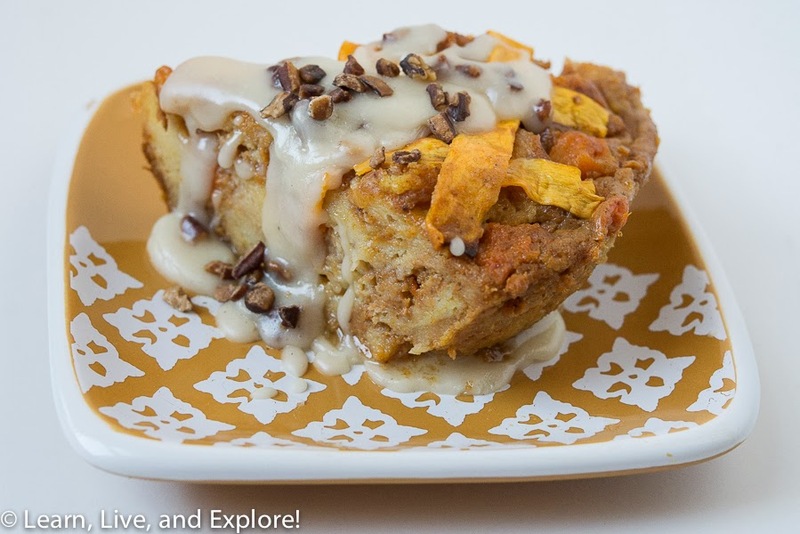 The result was this pumpkin and butternut squash bread pudding with a bourbon pecan sauce from Food & Wine. 3. Cut the neck from the butternut squash. Peel the neck and cut two 3/4" thick slabs. Slice on a mandoline, medium thin setting, to create the strips for the lattice. Cut remaining squash, bulb and leftover neck, into 1/2" dice. 4. In a skillet, melt 3 Tbsp of butter and sauté the diced squash over high heat until lightly brown. Add 1/4 cup of sugar and cook, stirring occasionally, until tender and glossy. Cool. 5. Butter two 9", deep-dish pie pans - glass or ceramic. 6. In a large bowl, whisk 1 cup of sugar with the eggs, milk, pumpkin, cinnamon, nutmeg, cloves, and salt. 7. Add the sautéed squash and toasted bread to the mixture and gently toss to soak the bread. 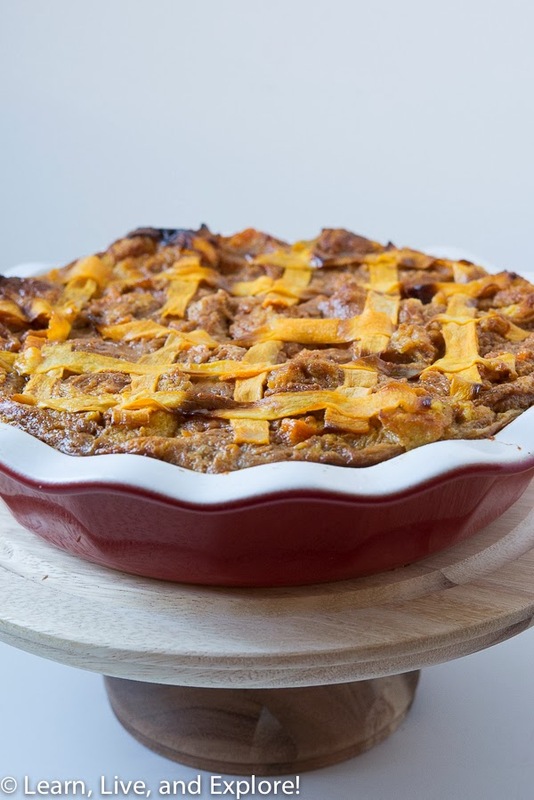 Spoon the soaked bread into the buttered pie plates and top with the strips of butternut squash in a lattice pattern. The squash will shrink, so make the strips a little longer than the shape of the pie. 8. Brush the "lattice" with melted butter and sprinkle with sugar. 9. Cover with parchment and bake for 30 minutes. 10. Uncover and bake for 30 more minutes, until the tops are golden and the puddings are set. 11. Let the puddings rest for 15 minutes. You can make the sauce and serve, or cover the bread puddings and refrigerate overnight. Just rewarm for approximately 15 minutes at 300 degrees F.
For the sauce, melt the remaining butter and whisk it with the bourbon, confectioner's sugar, and toasted pecans.